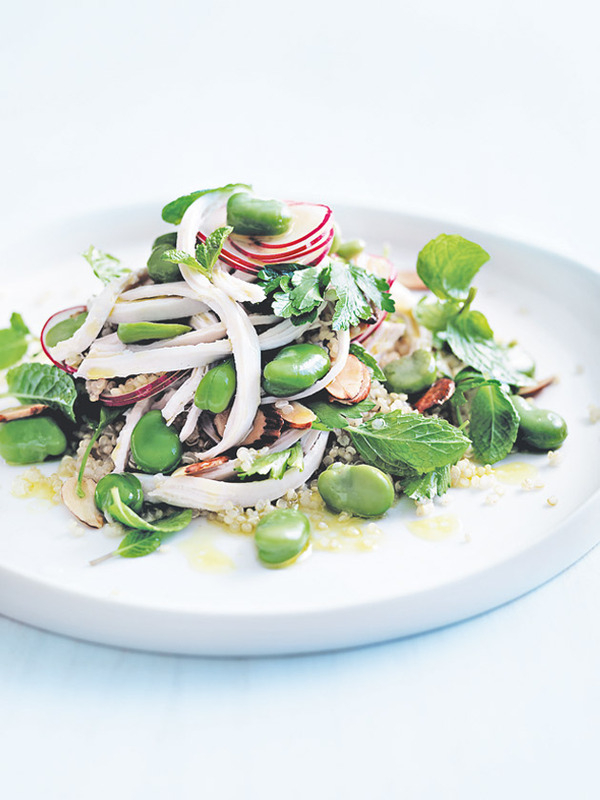 Place the quinoa, chicken, beans, radish, almonds, parsley, mint, salt and pepper in a large bowl and toss to combine. Place the lemon juice and olive oil in a small bowl and whisk to combine. Drizzle over the salad and toss well to combine. Divide the salad between 4 plates to serve. Serves 4. + You’ll need 1 cup (200g) uncooked quinoa to get the 2 cups cooked quinoa required for this salad. ++ Depending on the age of your broad beans, you’ll most likely need to shell the beans from their pods, and blanch them in salted boiling water for no more than 1 minute. Peel the grey skins to reveal the bright green beans, then refresh them under cold running water to halt the cooking process and retain their brilliant colour. Tip: Broad beans are in season in spring. When they’re unavailable fresh, you can buy them frozen at most supermarkets. Thaw the beans and use them as directed in the recipe.